The Fragile X Files: Fragile X Writers Series - Adoption and a Surprise! Fragile X Writers Series - Adoption and a Surprise! Today's guest post is by Faydra Stratton - whom many of you might know as the author of Groundspeed, the blog about her family's adventures in Fragile X and all the other aspects of life in sunny Florida! I have been following Faydra's blog (doesn't she have the most excellent name, by the way? I love it!) for years and just had the pleasure of meeting her in person, along with her husband and their darling three boys, at the Fragile X Conference in Miami last July. I have always found her story to be compelling, and I know you will too. It’s the day after Thanksgiving and like the rest of the country I’ve been counting my blessings, especially mindful of everything for which I am thankful. I’m thankful for certain moments: when the homework portion of our afternoon (or evening) is DONE, when all my kids are in bed actually sleeping, when I’ve got nothing more important to do but watch my favorite DVRed show and drink a mug of English breakfast tea, or when I find thirty stolen minutes to finally paint my toenails… Little moments when, if we stop to consider them, we should be thankful. And things. I am human. I like my things. I’m thankful for my new dress and fun red shoes that I bought for our Christmas card pictures. I am thankful when a new Amazon package arrives at our door as it usually contains new books for me or my boys. I am thankful for my soft bed and fabulous memory foam pillow. But above the moments and the things are the people. I am most thankful for my friends and family. As a Fragile X carrier I have an interesting cast of both friends and family, but for all their quirks and in some cases, limitations, they are an incredible bunch. I knew I was a Fragile X carrier before I started my family. Back when my husband was just my boyfriend I learned of the possibility that I was a carrier. I have a half sister whose son was diagnosed with Fragile X. For some reason it never occurred to me that she could have become a carrier through her mom, and I accepted that the pre-mutation had been passed down by our father - that I was a carrier too. I explained all this to Kevin, the boyfriend. It didn’t matter to him. Oh yes, I’m thankful for Kevin! We married in August 2001 and in November 2002, I participated in a study on carriers that included genetic testing and counseling. There it finally was in black and white on letter headed paper, a repeat count in the FMR1 gene of 106, a repeat unstable enough that it was “very likely (>98%) to expand to a full mutation should it be passed on to a child.” The odds of passing this on to a child were 50%. The latter half of this letter discussed our options when family planning: preimplantation diagnosis, egg donor, adoption, or just taking our chances. We were thankful for knowledge. We were thankful for guidance. We were thankful for choices. Since my teen years I’d always thought it would be “fun” to adopt a gaggle of kids, from various countries, all the colors of the rainbow. Then I grew up and realized I did not have the budget of Angelina Jolie. Even so, when we learned of our high risk of having a special needs child with Fragile X, we didn’t hesitate to pursue adoption. We weren’t ruling out the “taking our chances” option, but we knew that international adoption involved lots of travel of long distances for lengthy amounts of time. We didn’t see how we could do that with a special needs child. If we were going to adopt internationally we felt we should do it first. In February of 2005 we flew to Russia (Brrrrr!) and met our son in the City Baby Orphanage of Volgograd Russia. His skinny 11-month-old frame showed the scars of a recent bout with Chicken Pox. It broke our hearts to leave him there, but that’s what the process required. We had to “accept our referral” in persona and then return state-side until we were assigned a court date in Russia. That summer we finally returned to Russia to bring our oldest son home. When we felt ready to add to our family again we knew we couldn’t afford another international adoption and we still didn’t feel ready to take our chance with a pregnancy. We’d had close friends become foster parents and our eyes were opened to the need for more foster families. We soon became licensed, explaining to our caseworker that we wanted to foster but we were open to adoption. We only had one placement. This time the skinny 11-month-old showed up at our door. It took two years and a custody battle with a jury trial, but shortly before Blue’s third birthday the courts decreed what we’d known all along, Blue belonged in our family. We were thankful for God’s faithfulness through a long process. We were thankful for battles won. I started my ninth month of pregnancy during Blue’s trial. Our third son, Toby, was born to us months before we even had Blue’s final adoption hearing. We were NOT thankful for that surprise. The timing! And Blue! He was such a handful. I’d decided we were done, OR we’d wait till Blue was in kindergarten and then maybe have another “set” of kids close in age. We grew thankful that even though we didn’t think we were ready for a child with Fragile X, God knew better. We didn’t pursue a prenatal Fragile X diagnosis. We had enough on our plate with the trial and wanted the pregnancy part of our lives to be stress-free. Toby arrived a healthy 8lb 15oz baby. I did not know at the time that the little hernia he’d had was typical of Fragile X babies. I did wonder if some of the issues he had with nursing were related, but we eventually worked them out, and he didn’t suffer from the extreme reflux or fussiness I’d read some Fragile X infants have. 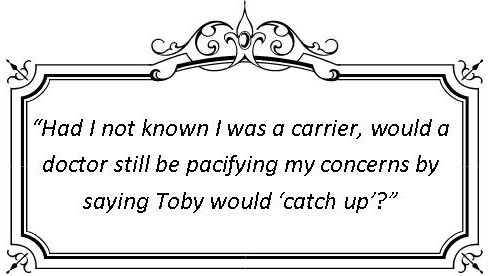 Instead of the low tone and floppiness I’d been told to look for, Toby was strong and often rigid. He kicked himself off the couch at two weeks old (No Mom of the Year award for me.) and rolled over at 5 weeks. (This is early.) 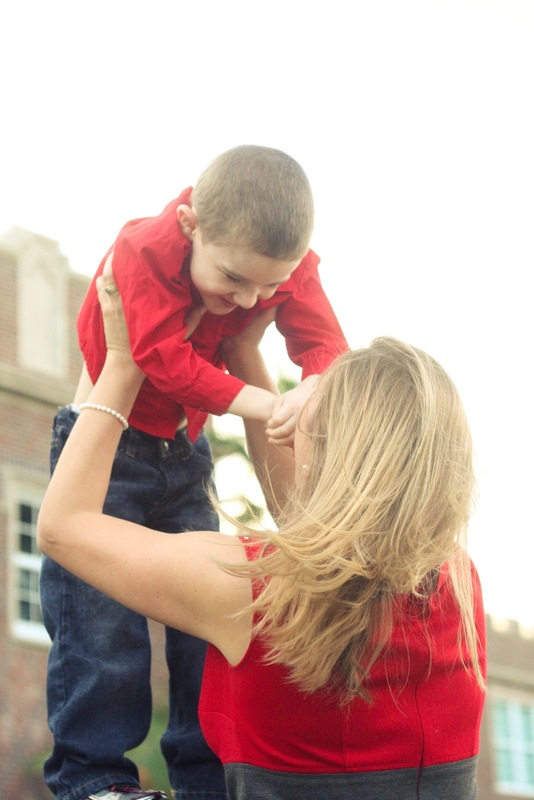 Even so, Toby’s Fragile X diagnosis at 2 ½ months wasn’t exactly a surprise. Even so… I felt gutted. This was not something we wanted for our son, but it didn’t stop our thankfulness for his place in our family, his addition to our lives. We were thankful for the early intervention Toby received, for a quick diagnosis that guaranteed services even when he managed the sit up/crawl/walk milestones with the “normal” range. He even had words around his first birthday. Maybe because he’d already started speech therapy around 8 months old? Because of his early diagnosis we were also able to join the Fragile X community and reach out for support quickly. We were thankful we didn’t have to struggle alone. We joined the National Fragile X Foundation within the first week of Toby’s diagnosis and spoke to their on-staff genetic counselor. I joined an online listserv right away as well . I read blogs by other Fragile X parents. We took Toby to a Fragile X clinic when he was 18 months old. We planned to attend a National Fragile X conference which we were able to do this past July in Miami. Toby is now three and a half. Just this week I was marveling at what a good climber he has become on the playground. He can speak in sentences and answer an assortment of questions. 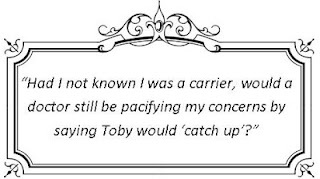 Had I not known I was a carrier, would a doctor still be pacifying my concerns by saying Toby would “catch up”? Would Toby’s anxiety related vomiting be attributed to stomach issues or diet? Would his moments of hyperarousal be misinterpreted as tantrums? At an age where families are finally getting a diagnosis, we are already deep into our Fragile X journey. It’s not an easy journey . It’s not the journey we planned. But we were prepared, and for that I am so thankful.